(Dec. 12, 2018) Chief of Naval Operations (CNO) Adm. John Richardson talks with Sailors stationed at Navy Support Facility Panama City during an all-hands call with Master Chief Petty Officer of the Navy (MCPON) Russell Smith. Plan to guide procurement, training, reforms to compete with China and Russia. 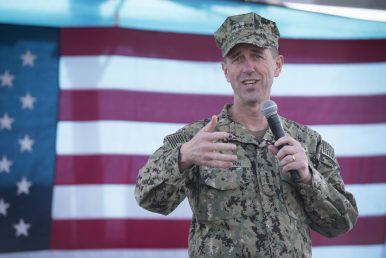 Admiral John Richardson, the U.S. Chief of Naval Operations, has released an updated plan outlining how the U.S. Navy intends to preserve and expand its warfighting advantages, particularly against the growing capabilities and of the Russian and Chinese militaries. Version 2.0 of A Design for Maintaining Maritime Superiority builds on an earlier effort from 2016 that outlined broad organizational attributes that Admiral Richardson wanted to guide the Navy’s thinking and efforts, and major lines of effort to modernize and reorganize itself and build critical partnerships. Since the original Design, the Trump administration released its National Security Strategy, the Defense Department release a National Defense Strategy, and the security environment came into sharper relief, motivating this reassessment and update. The mission statements remain largely the same between the two documents, to protect the United States from attack, preserve U.S. influence abroad, deter aggression, and conduct combat operations to defeat an adversary if deterrence fails. Version 2.0 adds an additional mission priority: to promote American prosperity. The National Defense Strategy focuses on long-term strategic competition with revisionist powers: China’s efforts to establish regional hegemony in the Pacific, displacing the United States’ position, and Russia’s influence over its neighbors and efforts to disrupt NATO, and both their efforts to undermine the post-WWII international order. The U.S. Navy’s original Design also identified China and Russia as principal challengers in the security environment. The Design 2.0 reflects the National Defense Strategy’s even stronger emphasis on this challenge, warning that Eurasia could become dominated by rivals and that Russia and China are accumulating power at the United States’ expense. As a result, the Design notes that the U.S. Navy has not had to compete for sea control, sea lines of communication, access to world markets, and diplomatic partnerships for decades, and it will respond to this security environment “with urgency.” The U.S. Navy intends to build both concepts and capabilities to be able to impose costs on adversaries across a spectrum of competition and conflict, from peaceful presence day-to-day, escalating to total war, and the challenging “gray zones” in between. To strengthen its ability to project naval power, the U.S. Navy wants to accelerate the completion and deployment of the new Columbia-class ballistic missile submarines to support nuclear deterrence; complete the re-establishment of the Norfolk-based Second Fleet and make both it and the west coast-based Third Fleet expeditionary, building on the Third Fleet Forward concept experimented with in the Pacific Fleet. The U.S. Navy is putting focus on maturing the Distributed Maritime Operations concept, which will build on the earlier Distributed Lethality concept designed to increase the combat effects of individual ships to fighting at a fleet level. The concepts will be tested and validated by a Large Scale Exercise to be conducted in 2020. The first production unit of the W76 mod 2 warhead has been produced in Texas.